Vyasayogicharita of Poet Somanatha is a biography of Vyasatirtha, a well-known saint scholar of Dvaita tradition. He was introduced to Chandragiri King, Salva Narasimha by Sripadaraja tirtha of Mulabagilu. Later when Salva family took the throne of Vijayanagara, Vyasatirtha was invited to Vijayanagara and he stayed at that place as Rajaguru. The main events of Vyasatirtha's life are discribed by Somanatha in this Vyasayogicarita. It is a Champu type of poem. It is a mix of prose and poetry as the Champu type of poem is expected to be. 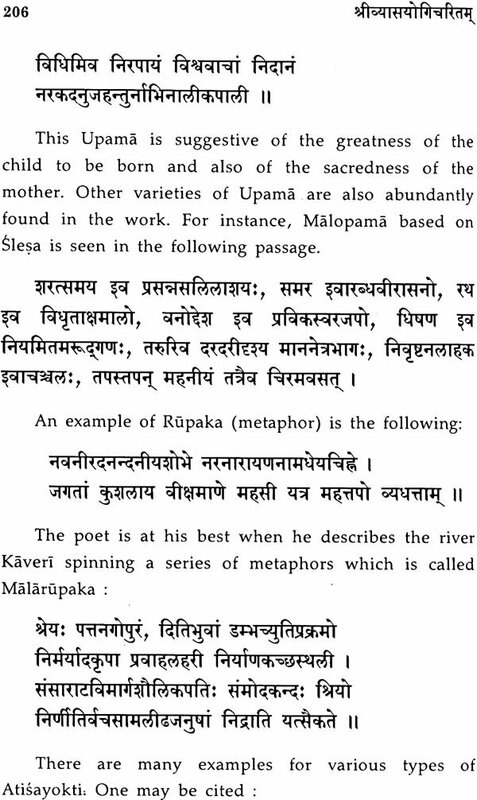 The prose portion of it follows the style of Kadambari of Bana while poetry follows the style of Sisupalavadha of Magha. 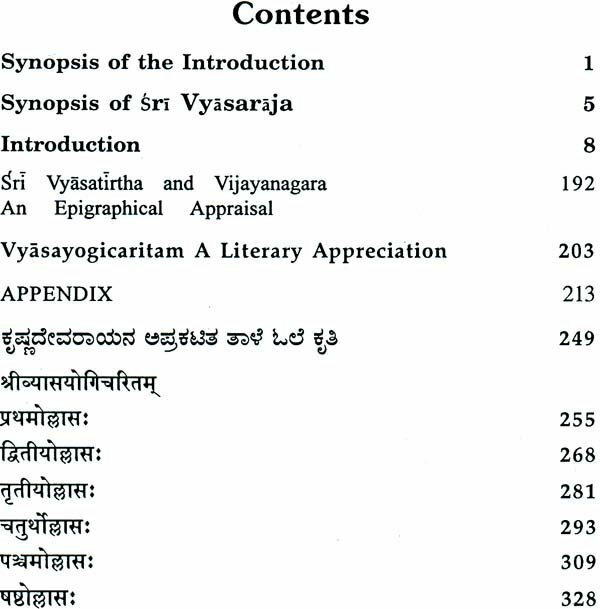 Among the events discribed here the scholarly debate of other scholars with Sri Vyasatirtha is graphically discribed King Krishnadevaraya's devotion to Vyasatirtha is also described in a touching way. During Kuhayoga Vyasatirtha himself occupied the throne and avoided the evil effects of Kuhayoga for the king. Vyasatirtha made the king to donate aqraharas to many scholars. He himself donated some aqraharas to the scholars. We are happy to publish Sanskrit biography of such a great scholar. This was published long back in 1 926, by Sri B. Venkoba Rao with a detailed introduction in English giving a detailed account of Vijayanagara history at King Krishnadevaraya's time. As it was very informative and useful we have reprinted it in the present edition. Dr. Srinivasa Ritti, a scholar in ancient Indian history who has edited the inscriptions related to Vijayanagara in three large volumes has discovered about a dozen inscriptions in three languages viz. Telugu, Tamil and Kannada related to Vyasaraja and has made an assessment of these for the history and personality of Vyasatirtha. It is also included in this volume as a separate introduction. The inscriptions are also printed separately as appendix. Sornanatha's biography of Vyasatirtha is full of poetic beauty. Dr. H. V. Nagaraja Rao has made an appreciation of this aspect of Vyasayogicharita in a separate article. This is also included in this volume. We hope this volume will be very useful to comprehend the greatness of a scholar i.e. Sri Vyasatirtha. 1. Mr. Sewell has written of a "Forgotten Empire" and Dr. Krishnaswami Ayyangar has written of "A Little Known Chapter of Vijayanagar History". Forgotten indeed is the Empire, and little known indeed is the Chapter, if the roots of the present, which are in the past, can be said to be forgotten, or little known. But as Mr. Surya- narayana Rao has observed, the Empire is really never-to-be-forgotten; and the "Little Known Chapter" has always been well remembered, though, as is usual in India, the dates and the chronology of that Chapter faded from men's memories. Krishnadeva Raya, the greatest of the Vijayanagar Emperors, himself prayed that his Empire might never be forgotten, and that the fruits of his rule might last to the remotest periods of time. 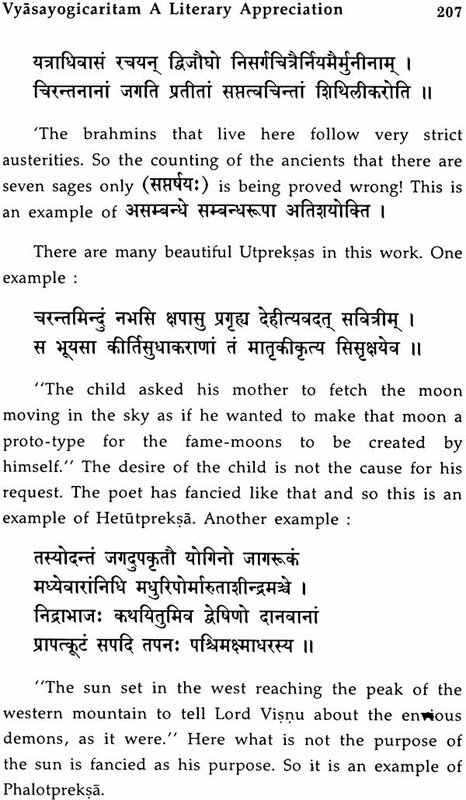 For, this is really what he says, in his Jambavatikalyana in a sloka of benediction at the end. And the little known chapter is of the time, when Sri Vyasaraya, the guardian saint of the second and third dynasties of Vijayanagar, was worshipping God Srinivasa, the tutelary deity of the two dynasties at Tirupati, a time, even now well remembered by the people who, even to-day, are devotees of God Srinivasa. 2. It is indeed fortunate that the manuscript of the present work, Poet Somanath's Vyasayogi Chari tam has been preserved. It was not given to Mr. M. Srinivasamurti, the late Sarvadhikari of Sri Vyasaraya Mutt, to realize his ambition of seeing the publication of this valuable work in his own lifetime. He had an unselfish love for good causes, and gratitude is due to him, for having secured this manuscript and financed its publication from his own funds. But for his devotion, the manuscript would, in all probability, have been lost in the floods that rose in the Cauvery, a few months after he brought away the book to Bangalore. One wonders whether the benediction of Sri: Vyasaraya to poet Somanatha, was really all-powerful and preserved the manuscript and Somanatha's name with it, from the floods as well as from the oblivion of Time. 3. The work has more historical information than I gathered at the first reading. I had hesitated to assume that Narasimha, to whose Court Sri Vyasaraya went at the request of Sripada Raja of Mulbagal, was indeed Saluva Narasimha I, as the word Saluva was not used in the work. It is now, however, quite clear that Saluva Narasimha I is meant; for, his son Thammaraya is mentioned It is started that Sri Vyasaraja was to Thammarya like Brihaspati to Indra. Narasimha of this book IS addressed by Sri Vyasaraya at pages 49 and 50 of the present work, in terms which would fitly apply to Saluva Narasimha 1. Narasimha Maharaya that is mentioned in the inscription at the Vyasaraya Mutt on Tirupati Hill (No. 74 of 1889 of the Madras Epigraphist's Collection), may therefore be safely identified with Saluva Narasimha 1. This inscription refers to a theft of temple jewels by the temple servants, and this is evidently a reference to the incident that, according to tradition, led to the worship of God Srinivasa on Tirupati Hill being entrusted to SrI Vyasaraya. Sri Vyasaraya worshipped the God on Tirupati Hill for twelve years according to tradition. At page 53 of this work, many years' stay at the Court of Saluva Narasimha I is mentioned. The period of stay at Tirupati probably began not later than 1486 A.D. The words already quoted, appear to show that Narasimha had, at the beginning of the period, newly begun to protect the kingdom, and the latest of such occasions was, when the sovereignty of the Vijayanagar Empire was assumed in 1485-86 A.D. The fact that Sripadaraja recommends Sri Vyasaraja to go to the Court of Narasimha, and the fact that Narasimha began to rule recently, give rise to the inference that it was Saluva Narasimha I that seated Sripadaraja on his own throne, according to the tradition preserved in the following sloka of the 4. 1486 A. D. indeed saw the end of an epoch and the beginning of another. One hundred and fifty years had then elapsed from the founding of Vijayangar by Vidyaranya. The Vidyara..flya Kalagnana says in prophetic style that in 150 years, the Royal Family founded by Vidyaranya will come to an end. 1486 A.D. is also suitable as a year in the end of Sripadaraya's life. His contemporary, friend and relation Brahmanya Thirtha who was the Guru of Sri Vyasaraya must have already died about the year 1475 AD., for, at that time occurred a great famine, soon after which, according to tradition, he is said to have died. Vira Narasimha, who seated Sripadaraya on his own throne, is said to have done so, after having been freed from the sin of killing Brahmans. And this sin of killing Brahmans, one may venture to think, was incurred, when the Srivaisnava archaks on Tirupati Hill were punished, after which event, Sri Vyasaraya was given the worship of the God. A reason for the removal of the Sri Vaisnava Archaks at Tirupati Hill may appear, if it is remembered that Saluva Narasimha I had, at that time, usurped the throne of Vijayanagar, or asserted his independence of Vijayanagar, if it was earlier than 1486 A.D., and that, according to the Prapannamrita, Srivasnavas were powerful with Virupaksa at Vijayanagar (p.73 of the “Sources of Vijayanagar History”) and may have been hostile to Saluva Narasimha 1.